Surround yourself in history with a visit to Antietam National Battlefield, where a bloody battle on September 17, 1862 helped decide the fate of the nation. Discover the battle’s connection to the Emancipation Proclamation and how it forever changed the course of American histo. Antietam tells the stories of the soldiers who fought here and of the generals who led them into battle. Learn about the civilians caught up in the whirlwind of war and how their lives were affected by the terrific combat that raged on their farm fields and in their backyards. Investigate battlefield medicine at the Pry House Medical Museum, which, during the battle, served as the headquarters of Union General George McClellan, commander of the Army of the Potomac. Walk along the battlefield’s many scenic trails, and step inside the famed Dunker Church, the modest white-washed meetinghouse of the local Baptist Brethren congregation, which, during the battle, served as the focal point for many attacks. Imagine the thunderous din of artillery and sharp rattle of thousands of muskets as you explore farmer David R. Miller's 24-acre cornfield, scene of some of the most horrific fighting of the Civil War, or as you journey through the West Woods and walk along the sunken road now known as Bloody Lane. 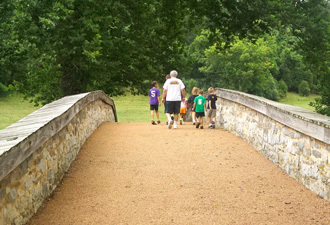 Envision cheering soldiers and their torn and tattered banners sweeping past you as you walk across the Burnside Bridge, today one of the most recognizable landmarks on any Civil War battlefield. And listen carefully as the waters of Antietam Creek flow peacefully by, just as they did 150 years ago when soldiers of two great American armies met in mortal combat. Finally, reflect upon the service and sacrifice of those many thousands who fought and died on these now quiet and peaceful fields during what remains the bloodiest single-day battle in all of American history, and consider the impact of their loss on their families at home as you walk through the rows of silent graves in the national cemetery. Located just outside Sharpsburg in rural western Maryland, Antietam National Battlefield is a crown jewel among national battlefield parks. 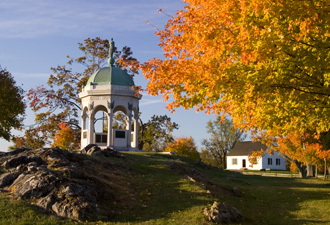 Antietam is one of the best preserved and certainly one of the most idyllic, with monuments and cannons now standing in silent testimony to deeds of valor witnessed in September 1862. You can tour and explore the battlefield on your own and at your own pace, following the self-directed auto tour route, or you can join a ranger for many different interpretative programs. At the Antietam Museum Store, in the visitor center, you can inquire about hiring your own personal licensed battlefield guide. Antietam National Battlefield is open year-round, closed only on Thanksgiving, Christmas, and New Year’s Day. Readily accessible from Interstates 70 and 81,it’s within easy commuting distance of both Washington, D.C., and Baltimore. 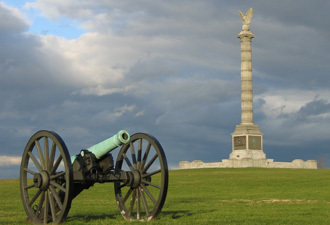 You can spend a day touring the battlefield, taking part in ranger programs, viewing the movie, perusing the museum, and hiking one or more of the park’s many battlefield trails. For directions and for more information, please visit the website or call 301-432-5124.